and asks for human sacrifices. Sometimes it is a female. 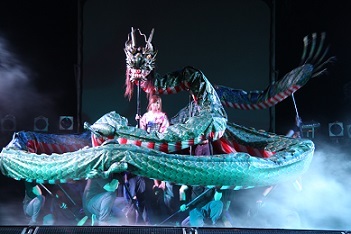 In the traditional Kagura dance, the serpent is called Orochi 大蛇 . 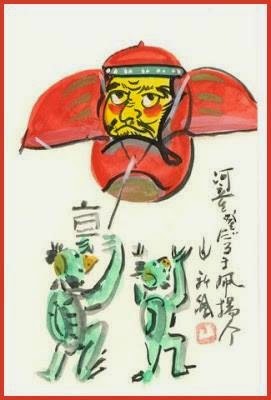 Sometimes the Daija as a deity is venerated in rain rituals.
. Guchinawa (Kuchinawa) グチナワ huge white serpent .
. nozuchi 野槌 tsuchinoko ツチノコ / 槌の子 "hammerspawn" snake . A serpent may turn into a dragon . . .
. ryuu, ryū 龍　竜　伝説　Ryu - dragon legends .
. Benten to hebi 弁天と蛇伝説 Legends about Benten and serpents .
. 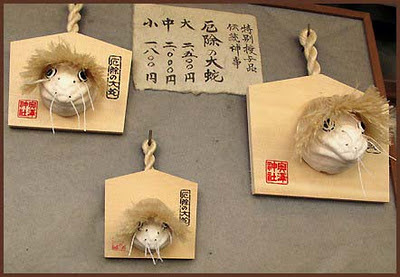 Silk - kinu - 絹 silkworms and Serpent legends . "8-branched giant snake") or Orochi (大蛇), is a legendary 8-headed and 8-tailed Japanese dragon. Yamata no Orochi legends are originally recorded in two ancient texts about Japanese mythology and history. The ca. 680 AD Kojiki transcribes this dragon name as 八岐遠呂智 and ca. 720 AD Nihongi writes it as 八岐大蛇. In both versions of the Orochi myth, the Shinto storm god Susanoo or Susa-no-Ō is expelled from Heaven for tricking his sister Amaterasu the sun-goddess. The shrine dated back to 1272, Hojo Shiro and his son Tokichiyo, who developed the land in this area.
. - suijin 水神 water deity - . Water deity worshiped at sources of irrigation waterways, lakes, ponds, springs, and wells. The suijin has been represented in the form of a serpent, an eel, a fish, and a kappa or water sprite. Women have played an important role in the history of suijin worship. If someone walks around the pond seven times in deep prayer, he will be able to see the Master of the Pond. 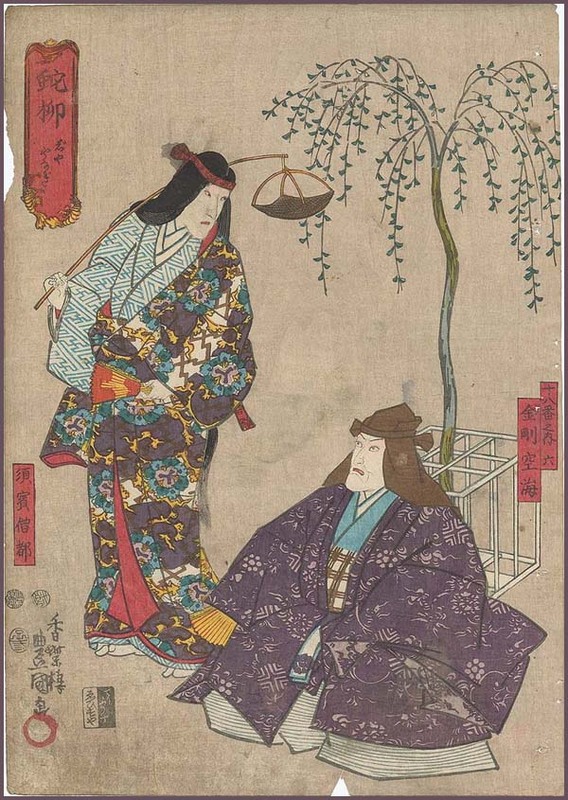 During the hottest days of the year (doyo 土用) the female Master 雌蛇 will go to the pond of the male master 雄蛇ヶ池 Ojaga Ike. 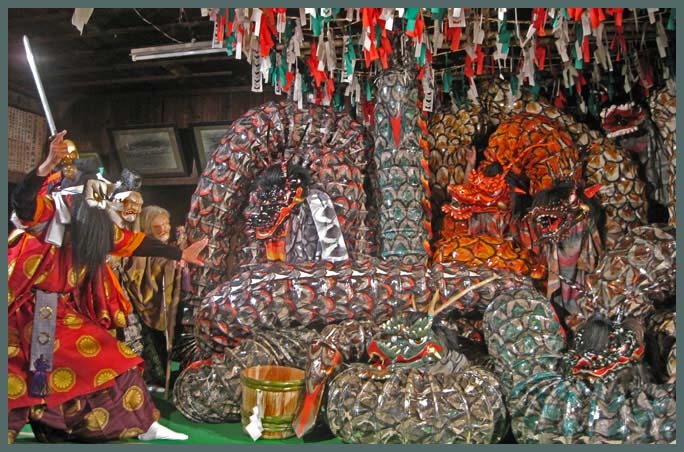 During that time is will be possible to hear the female serpent.
. . . CLICK here for Photos of Ojaga-Ike ! Once upon a time an old man pleaded with the Master of the Pond 蛇ヶ池 Jaga-Ike during a long dry spell. He promised to give one of his daughters as a wife to the Daija if rain would fall. Soon it rained and shortly after the Daija in the form of a young man came to get his bride, the youngest daughter. She took a bag with needles with her. At the pond the man changed into the Daija and wanted to throw the girl in, but she stuck the needles into its body, so he jumped in surprize and both were not seen any more. A few days later the house of the man burned down. Two large serpents had build a ring around the house and asked for water, but the villagers were too surprized and run away. The two serpents burned down with the house. In the village of Anpachi lived the rich family of 安八太夫 Anpachi Daiyu. One year during a severe drought, he prayed at the pond and promised one of his daughters if it would rain. Soon it rained and shortly after the Daija came to get the youngest daughter. She was now the wife of the Master of Yashagaike 夜叉が池. Once she came back home to visit but when she took a nap during daytime she asked to keep the door shut and nobody come in while she slept. But when her mother came peeking she saw her daughter had changed into a Daija. From that time on, she never came back to visit her family. Now there is a festival to celebrate this legend.
. Legends about Master Carver Enku　円空と伝説　. Once upon a time a hunter was sharpening his arrows. A small serpent came along to watch. He wanted to chase it away and hit it with his arrow in the upper jaw. The monster fled to the pond and jumped in with a howl. The water produced a huge whirlwind. The neighbours came by to see what was happening. They found the Master of the Pond with its upper jaw smashed and quite dead in the water.
. Daija from 榛名湖 Lake Harunako . 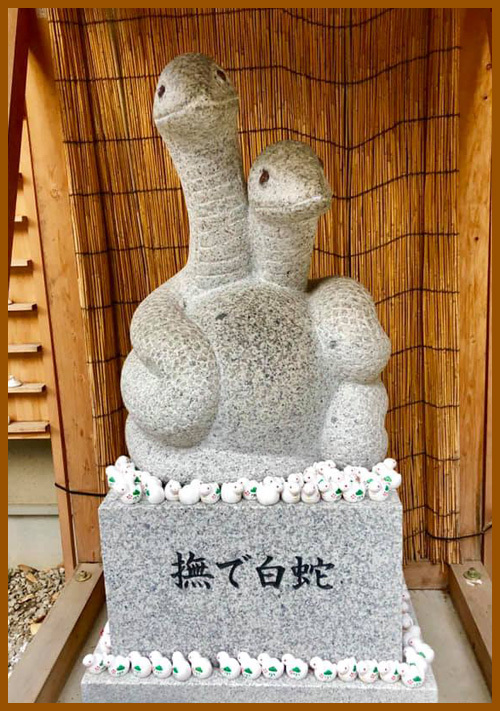 This is not a story about the "Ike no Nushi", but about a serpent granting happiness to a young couple.
. mugiwara hebi 麦藁蛇 serpent made from straw .
. legend from 久慈郡 Kuji district 大子町 Daigo . In front of the school in Annaka there is a ond called Annaka Ike, where a huge serpent lived as the Master of the Pond. On day when it rained a farmer passed by and needed to pee. When he walked back later he saw a beautiful lady by the pond. She asked him to see her home, so he did. There was another pond just a bit further down the road. When the two walked past it, the lady stopped and claimed she had now found her way. In departing she said: "Tomorrow there will be a loud thunder as a sign that I am home safely!" The next day indeed there was a loud spell of thunder. The farmer was quite happy and he became a rich and benevolent person during his a long life. Nobody had ever seen the serpent Master of the Pond. Once a fisherman came by the pond and met a beautiful lady. He helped her get to the other side of the large lake in his boat. In departing the lady told him she was the Master of the Pond. She also said there would soon be a huge storm. So he wanted to go back as fast as possible but the storm was faster and he had to stay in a small hut at the other side for a few days. Once day the Master of the Pond lost the trust in her power to be the protector of the village. She turned into a girl and left the village to live quietly in another pond. When the villagers came to ask for a rain ritual ( amagoi 雨乞い) as usual during a drought, the deity told them that there was no Master of the Pond any mroe. The Master of Midoro-ga-Ike is a huge serpent, so thick that a man could not grab it around with two arms. Farmers were not allowed to touch the water, lest they would be destroyed by a curse. a young man passed by and saw a huge log lying straight across the road. He wanted to kick the log away, but it began to move all by itself and slipped into the water. The young man now realized this was the Master of the Pond and began to fear for his life. there was a plan to dry out the ponds for land reclamation, but all the officials of the Kyoto government in charge of this plan died, one after the other. was built at the North side of the pond. The Master of the Pond used the gatekeeper as his medium, claiming since his home was not destroyed they should build a small 祠 sanctuary and venerate him there. They did so for two or three years, but then the rituals at the sanctuary were stopped, it was all declared as superstition by the manager. Well, very soon after this, the two sons of this manager died. The Kyoto Valley was formed and built up by sedimentary deposits carried from the nearby mountains. The ponds “Shinsenen” and “Midorogaike” still remain in Kyoto as evidence of the ancient lakes that were filled by rain washed mountain sediments. 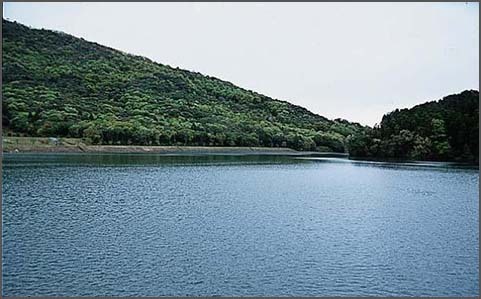 This “ancient lake” area is the reason for the many springs that help create an extremely humid environment. These unique characteristics make Kyoto a place of outstanding natural beauty with tremendous seasonal changes. ”Chilled to the Bone in the Winter”, the “Heat and Humidity of Summer” in contrast to the “Mild Spring and Fall”. The Master of the Pond of 鏡ヶ池 Kagamigaike on the island 池島 Ikeshima is said to be a bull. Therefore no bulls are kept on the island. Other legends say it is a Daija, a girl that was once the daughter of a rice merchant from Higo 肥後の米屋. 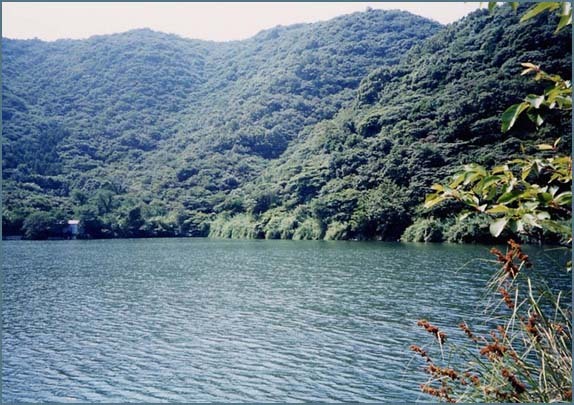 Once a girl from the village went to the Himetani Pond to do her washing. At the bank she found a nice hair pin and picked it up. When she tried to stick it into her hair, it turned into a huge serpent, which swallowed the girl. When she did not come home that night, her parents got worried and went looking, but found only her wooden sandals and the washing on the bank. Now they new the Master of the Pond 大蛇 had gotten her. So they erected a stone memorial in her honor . . . and since then the name of the pond became "Princess Valley Pond". Even now it is an eerie, gloomy pond. The farmers make a huge serpent with straw from wheat (mugiwara 麦藁) and throw it into the 三ツ沢池 Mitsuzawa pond. When they throw in a serpent made of straw, the real Daiji will know that it has now to come out and provide rain for the parched fields.
. Daija and Yamanokami 山の神 . Daija is one of the "seven wonders of Shikao Onsen 鹿塩温泉 Hot Spring"
At the pond Komagaike 駒ヶ池 the master is a Daija. It used to lend trays and bowls to the villagers. there came a samurai and tried to expel the Daija of the pond. When he saw a young woman near the pond, he killed her with his sword. The body of the woman vanished in the sky, but on the next day he saw he had cut off the branch of a willow tree by the pond. To confuse the samurai, the Master of the Pond might have taken the form of a willow tree. is also the title a famous Kabuki play: Snake Willow. But this is related to a story from Koyasan and Kobo Daishi.
. yanagi 柳 willow tree - Introduction . two hunters came to the Honzawa gorge 本沢渓谷. At the riverbank they saw a huge serpent. The younger hunter became quite scared, and despite the warning of his older companion shot the snake in its head. But the snake did not die, it just jumped into the air and became invisible. How much they looked, not a trace of the snake was to be found. Then suddenly a thick fog rose from the river and the sky turned all black. For three days it rained constantly and the villages near the river were flooded and suffered great damage. After five days the weather finally changed and the sun came out again. One of the villagers told about a snake he had seen flowing by in the river. This must have been the Master of the Pond 赤沼の池 Akanuma no Ike. Once a farmer was cutting weeds near the pond, when a beautiful lady appeared and told him she was the Master of the Pond. After that the water in the pond never dried out, even in a drought. A few years later when he came again to cut weeds he observed some large waves heading North. The Master had left the pond to live in a different river.
. The master of the pond Akazu no Ike 明かずの池 . Once the Daija wanted to become a human, went to a nearby temple and prayed for 100 days, when she turned into a woman. Buddha 大日如来 Dainichi Nyorai helped her into the world of humans and found her a husband. When she was pregnant and ready to give birth, someone saw her real figure and she had to become a daija again. The Master of the Pond 尼池 Amaike (Pond of the Nun) was a Daija. He had fallen in love with a nun and jumped into the pond. tells about a sudden flooding in the region, when a nearby Buddhist nunnery (amadera 尼寺) was lost in the waters of the pond. The name of the pond is now どんち池 Donchi Ike. At the temple 長福寺 Chofuku-Ji a girl named O-Towa worked in the kitchen and one day went to the deep mountain to find some butterbur 蕗, but she got some mud on her undergarment 腰巻. So she went to the pont to wash it. There the Master of the Pond, a 大蛇 huge serpent showed up and told her that it was a custom that anybody who washed her undergarments in the pond had to become his wife within three days, so he would come and get her. Back home O-Towa became ill and stayed in bed. But three days later the Serpent appeared and threatened to bring great flooding if the girl would not come out. So she became his wife. A few days later a small island appeared in the pond as a proof that O-Towa had found her home in the pond. The pond was now named after her, Otowa-ike おとわ池 / 乙和池. Every year on the 23rd day of the 6th lunar month the villagers come to the pond and make offerings. 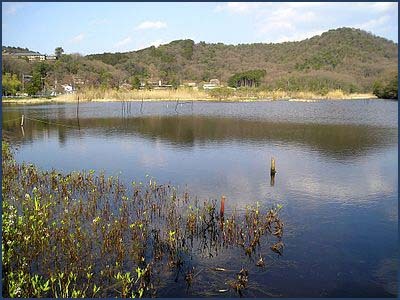 In the middle of the pool is the largest floating island on high marshy wetlands in Japan. Over 200 species of vegetation grow luxuriantly round about and the whole area is shrouded in a strange mysterious atmosphere. There is a legend about how the pool got came to get its name. According to the legend a beautiful maiden came one day to the Nagafuku-Ji Temple at the foot of the mountain and asked to stay there. The high priest feeling sorry for the girl agreed to let her stay. The girl said nothing about where she came from only that her name was “Otowa .” One year after the rice-planting was finished Otowa who had come to pick the sprouting grass found herself too close to the mountain which was forbidden to women and as she was running downhill in a panic she came to a little pool. Here she washed the hem of her underskirt in the water and the lord of the pool fell in love with her. At that moment in a flash the pool grew much bigger leaving only the place where Otowa was standing as a sort of floating island and the lord of the pool a huge snake appeared and told Otowa to stay here so that she could become the mistress of the pool and take charge of it instead of him. Otowa wept and pleaded so much that she was allowed to go home but three days later she heard the voice of the lord of the pool calling her name and at this she at last made up her mind to become the mistress of the pool. As she was making her way to the mountain in a box the sound of hoofs could be heard in the distance and the next instant a prince galloped up on a white horse and setting Otowa in front of him they both disappeared in a haze. The prince on the white horse was the snake-lord of the pool. For seven days after this day the mountain was wrapped in dew and on the seventh day the dew turned to a downpour and heaven and earth drew dark. The people of the village believe that this rain meant that the lord of the pool had gone to heaven and that Otowa had become the mistress of the pool in his place. Even nowadays on July 23rd the anniversary of Otowa's death the “Otowaike Pool Festival” is held to pacify Otowa's spirit. Near the pond タナの池 Take no Ike a man from the 小林家 Kobayashi family walked past, when he met a beautiful woman. Well . . they got married and when the first child was to be born, he saw to his horror many snakes in the maternity room of his wife. So the wife vanished, leaving a stick 杖一本 with the order to hit the lake if the child would cry. When the child grew up and cried one day, it hit the water and a huge snake pulled it into the water. From that time on, only the Kobayashi family became rich and prosperous. To our day this lake never freezes in winter. From Gamo Village you have to cross a pass to reach Nonomi-Ike, where a Serpent was living as the Protector of the Mountain and protect the village from drought or too much rain. The son of the Master of the Pond 蒲生の池 Kamo-no-Ike wanted the beautiful daughter of this serpent as his wife and asked the Master of Hanage-no-Ike 鼻毛の池 to be the middleman for the wedding. But the Master of Nonomi-Ike did not want to give his daughter to such a dirty pond and refused. The master of Kamo-no-Ike and the middleman from Hanage-no-Ike became angry, changed into young ladies and borrowed swords from the villagers. Finally they killed the Master of Nonomi-Ike. His blood flew down the river 保倉川 Hokuragawa and all the bamboo near the riverside was soon colored in red. From this day on, the bamboo of the riverside shows the strange pattern of a serpent. from 都窪郡 Tsukubo district, 庄村 Shomura village. Once there lived a beautiful girl named O-Tora お寅 in the castle town of Hikone 彦根. But the Master of the Pond emptied all the water and pulled the girl in. From that day on, there was always water in the pond, even during a drought. The Master of the Pond アゾノヤマの池 Azonoyama no Ike.
. Daija 大蛇 and Shakuhachi 尺八 flute .
. Shrine Okusawa Jinja 奥澤神社 - Setagaya . Okusawa shrine is famed for that 150kg, nine-metre-long daija, or shrine snake, draped over the torii gate at the entrance, which is often mistakenly referred to as a dragon.
. Serpent bones at 豊仙寺 / 宝仙寺 Hosen-Ji . The pond 日光池 Nikko Ike had been dried out and reformed to new fields. During the works the Daija got caught by the villagers. Since it was the Master of the Pond, they built the shrine 杉谷神社 Sugitani Jinja in its honor.
. saotome 早乙女と伝説 Legends about women planting rice . Serpent Pond 蛇の池 at Heigun . If people try to throw metal things into this pond, it will be back at the bank by next morning. the Master of the Pond took on the figure of a girl and asked a fisherman to take her to the other side. Over there she told him "As an expression of my gratitude I allow you to put your nets into the pond just once!" When he did so, it was a very rich catch indeed. So he became greedy and threw his net in again. But this time all he caught was a serpent and no fish at all. there are 976 entries for the "huge serpent" 大蛇 from all the prefectures !
. Kappa densetsu　河童伝説, Kappa minwa 河童民話 - Legends - Introduction . 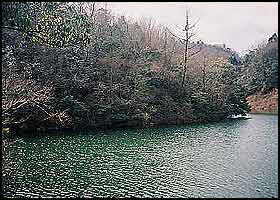 At the 池の薬師 Yakushi Pond there lived a husband and wife serpent. The husband snake got killed by a shot. The wife snake shapeshifted into a young woman, went to the temple and told the priest about it. Then she disappeared. Later when the priest went to the pond to perform amagoi 雨乞い rain rituals, it would always rain after his prayers. Priest Taicho had thrust his sword into a rock by the pond to bind and confine the serpents that had caused evil in the villages at the foot of the mountain. a huge serpent came swimming down from upstream Tonegawa. She climbed on a rock galled 龍王の岩 "Rock of the Dragon King". Between this and another rock was a small riverpool, and at its bottom is said to be a 竜宮 Dragon Palace.
. Yamata no orochi 山田の大蛇 huge Orochi serpent . When a young girl passed the Toad Riverpool, she saw a large serpent who had swallowed something strange and was in pain. The serpent is the master of the pond. The girl took the strange thing out of the mouth of the serpent to help the animal. The greatful serpent promised to grand any wish of the girl, but she should not talk about it to anybody. After she went home, many people came to her house and asked what had happened, so finally she told the whole story. Very soon after that the girl became ill and died.